Jensen's Inequality: the convex transformation of a mean is less than or equal to the mean after convex transformation. A graphical "proof" of Jensen's inequality for the probabilistic case. 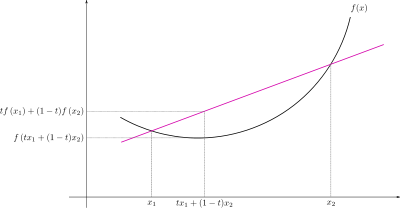 The dashed curve along the X axis is the hypothetical distribution of X, while the dashed curve along the Y axis is the corresponding distribution of Y values. 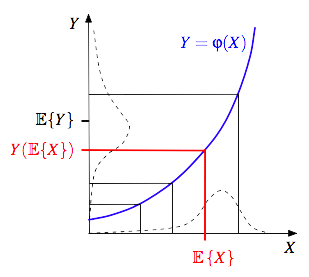 Note that the convex mapping Y(X) increasingly "stretches" the distribution for increasing values of X.